After a rocky start, Chicago Cubs manager Joe Maddon thinks Ian Happ finally can relax a little bit. Happ hit a tiebreaking two-run single during Chicago's four-run ninth, helping the Cubs beat the Milwaukee Brewers 5-2 on Saturday. "Whatever he's going to have tonight dinner dinner-wise is going to taste better, sleep is going to be much more tranquil and if he had a dog with him on the road he's going to love his puppy even more," Maddon said. "That's what happens after a hit like that." Happ struck out three more times, running his team-high total to a whopping 17 in seven games, before coming up with a clutch swing in his final at-bat. With one out and the bases loaded, he dumped a 0-1 pitch from Jacob Barnes into left-center to give the Cubs a 4-2 lead. "You've just got to keep working," Happ said. "It's the reason why we play this many games and it's a game of averages, because there's going to be some ups and downs. Hopefully this is going to be the biggest of the downs and I'll get back going on a normal pace." After Happ's single, Kris Bryant was intentionally walked, and Maddon sent starting pitcher Jon Lester to the plate to hit for reliever Pedro Strop (2-0). Lester got down a sacrifice that drove in Ben Zobrist from third for the final run. Barnes (0-1), who was filling in for injured closer Corey Knebel, was charged with four runs, two earned. He was hurt by errors by shortstop Orlando Arcia and third baseman Travis Shaw. Brandon Morrow got three outs for his first save since signing with the Cubs in the offseason. Milwaukee wasted a nice start for Zach Davies, who struck out eight while pitching six innings of one-run ball. Eric Thames homered in the fourth inning, and Lorenzo Cain hit a tiebreaking sacrifice fly in the eighth. "It's fun baseball," Milwaukee manager Craig Counsell said. "You enjoy it. It was a great ballgame, an entertaining game. We didn't make a couple plays in the end and they didn't make a couple plays that almost cost them. We'll come back." 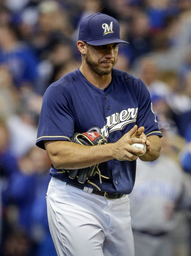 Bryant had three hits, including his second homer of the season, and walked twice one day after he committed a costly error in the ninth inning of Milwaukee's 5-4 win. The Cubs' ninth-inning rally began when Victor Caratini reached on an infield single with one out and advanced when Arcia's throw bounced past Thames for an error. Barnes then walked Jason Heyward and Javier Baez followed with a sharp bouncer to Shaw, who booted the ball to load the bases. Zobrist's infield single tied it at 2 and set the stage for Happ's big hit after a rough start to the season. "I think everyone saw the balls," Barnes said. "It was not like they were hitting bullets everywhere." Yu Darvish also bounced back from a rocky debut with the Cubs, striking out nine over six crisp innings. Maddon felt the right-hander got into a rhythm. "Everything becomes sharper," Maddon said. "I'm certain it's a feel thing for him." Cubs: 1B Anthony Rizzo missed his second consecutive game with back tightness and is day to day. Maddon said Rizzo was feeling better but he didn't want to rush it. Brewers: LF Christian Yelich (oblique tightness) is progressing but is doubtful to return Sunday, Counsell said. "I think we can get through the weekend and then I think we might be in good shape on Monday," he said. ... Needing a fresh arm in the bullpen, the team selected the contract of RHP J.J. Hoover from Triple-A Colorado Springs and optioned RHP Brandon Woodruff to its top farm club. LHP Tyler Webb was designated for assignment. Hoover got the last out of the ninth. Cubs: LHP Jose Quintana (0-1) is set to make his second start after allowing six runs in six innings in his season debut on April 1 in Miami. Brewers: RHP Chase Anderson (0-0) will make his third start, trying to rebound from a no-decision Tuesday when he allowed four runs in four innings against St. Louis.